On the Edge. The speediest dual-core processor in a compact 13" case with quiet fans? Find out why this might be a problem for Windows (Bootcamp) users but of little significance for Mac OS X users. The model we review here is the most powerful of the new 13" MacBook Pro laptops of the Early 2011 revision, model number MC724LL/A. Compared to the starter model, the laptop here comes with a faster 2.7 GHz Core i7-2620M dual-core processor and a bigger 500GB hard drive. At an extra 300 Euro, the more powerful model isn't exactly a bargain. Apple can claim that half of the extra cost goes to cover the Intel i7 CPU. The extra cost of the larger hard drive probably only adds up to 5-15 Euro. And the rest? Another Yacht for Steve Jobs? 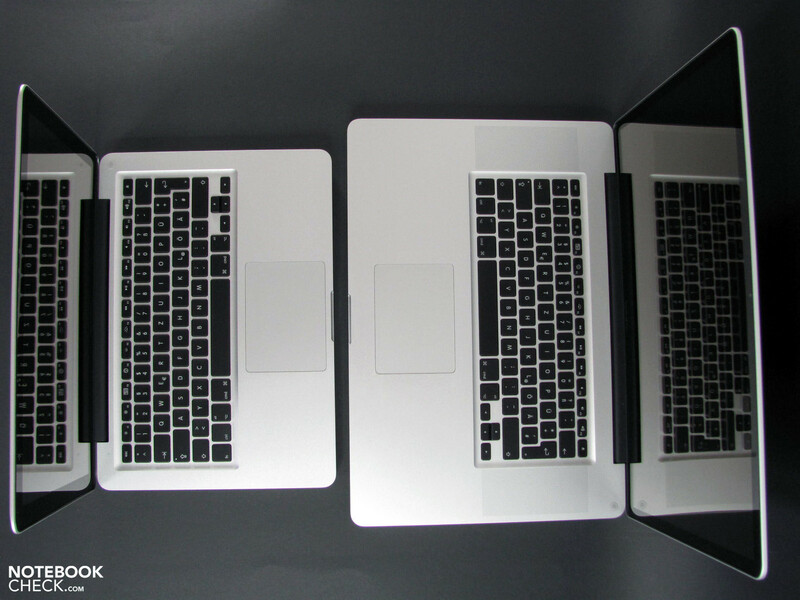 The case of the new MacBook Pro remains unchanged compared to previous generations. Once again, the case appeals with its sturdy build, excellent feel, while remaining very compact and light weight all the same. Despite the design remaining unchanged it still appears fresh and modern. The only persistent criticism from users is about the relatively sharp front edge. 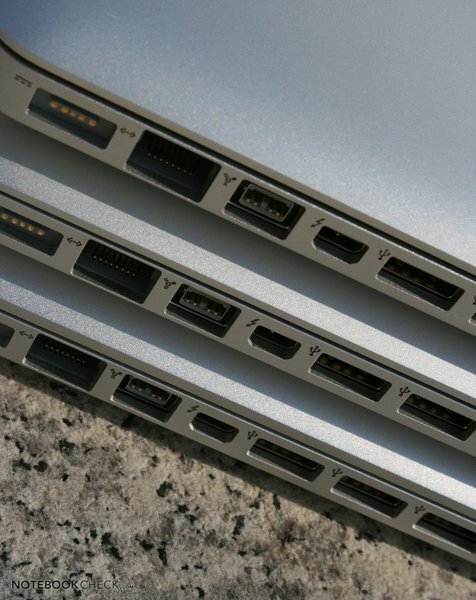 Apple is once again stingy with the ports. A combination microphone/headphones Headset Port which supports optical audio, only two USB 2.0 ports, Thunderbolt / DisplayPort Mini, FireWire 800, Ethernet and MagSafe power connector is all she wrote. The Thunderbolt port is a novelty which might prove very popular in the future. For now though, there are only two professional external hard drives which are compatible with this high-speed port. Thanks to its speedy transfer rates, the ThunderBolt port might find use as a docking station port, which would put to rest many of the sharp criticisms about the MacBook Pro. For now, this is only speculation, however. The positioning of the ports is convenient for right-handed users since all the ports are found on the left side, so there's plenty of space for an external mouse. Users who like to have a mouse on the left side might feel a good deal more constrained here. A small alteration is to be found within the case concerning the wireless internet connection. The Broadcom BCM4331 wifi card now uses 3 antennae, helping it achieve a slightly longer range and slightly higher transfer rates. Additionally, Apple has put in place a dedicated Bluetooth 3.0 chip (most likely the BCM2070 according to iFixit), but Apple is still advertising it only as the 2.1+EDR version. Furthermore, there's also an infrared receiving for use with the AppleRemote (unidirectional). Besides the laptop itself, the variety of accessories remains minimal, including a power supply and cable, a user manual called "Everything Mac", additional instructions called "Everything Else", two software DVDs, stickers and a cleaning cloth. The laptop comes with the Mac OS X 10.6.6 Snow Leopard operating system pre-installed. 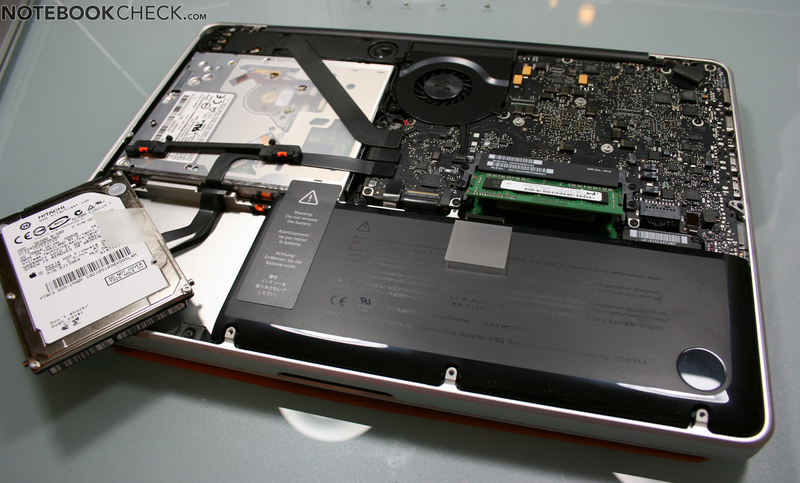 The MacBook Pro comes with a short 12-month warranty including 90 days of over-the-phone technical support. There's always the option of opting into the extended warranty called Apple Care Protection Plan (ACPP), which extends over-the-phone support to a total of 36 months from the purchase date. With the recommended retail price (RRP) of 249 Euro, Apple Care comes a bit cheaper here than with the 15" and 17" models (349 Euro)—still not exactly a bargain. 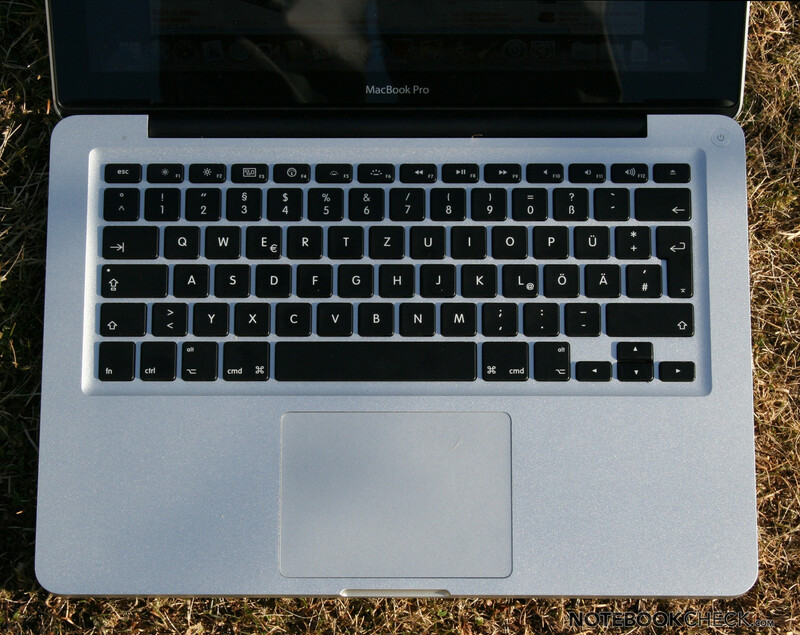 The input devices remain the same as those of previous MacBook Pros, which are by no means bad. The keyboard consists of 79 normally-sized backlit keys. Among these is the somewhat small "Enter" key. In the typical Apple style, the special function keys: Fn, Ctrl and Command are used for keyboard shortcuts, but Windows users might be a bit frustrated about ctrl key not doing "what it's supposed to". Note: most of the keyboard shortcuts using the ctrl key in Windows use the "command" key in Mac OS X but are otherwise the same: "command + P" = print. The keystrokes are soft with an easy-to-feel pressure point and make little noise. The keybed is very sturdy and therefore comfortable for hours of typing. There are no quick access buttons to control the hardware and no Fn key shortcuts to control wifi or bluetooth. On top of that, Windows users might miss keys like "Insert" and "Print Screen". 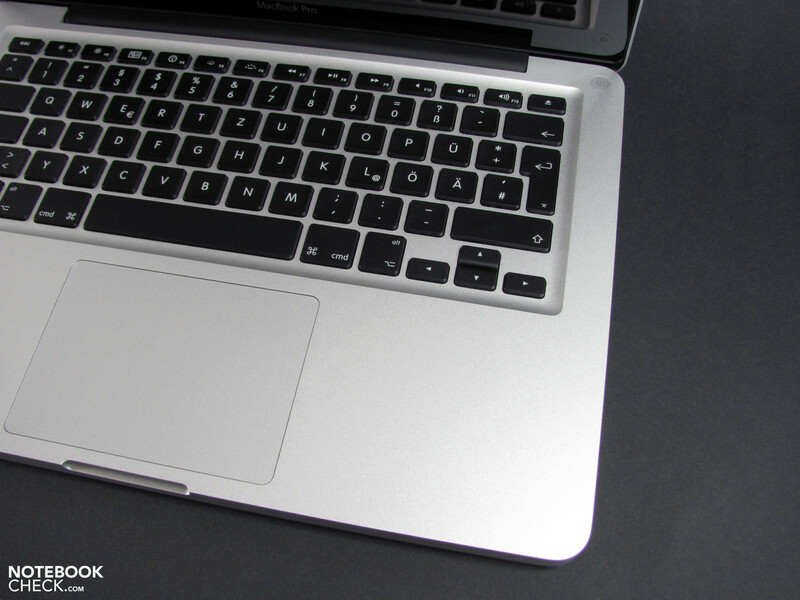 The enormous trackpad is ideal of multitouch gestures and its glass surface makes for very smooth control of the cursor. 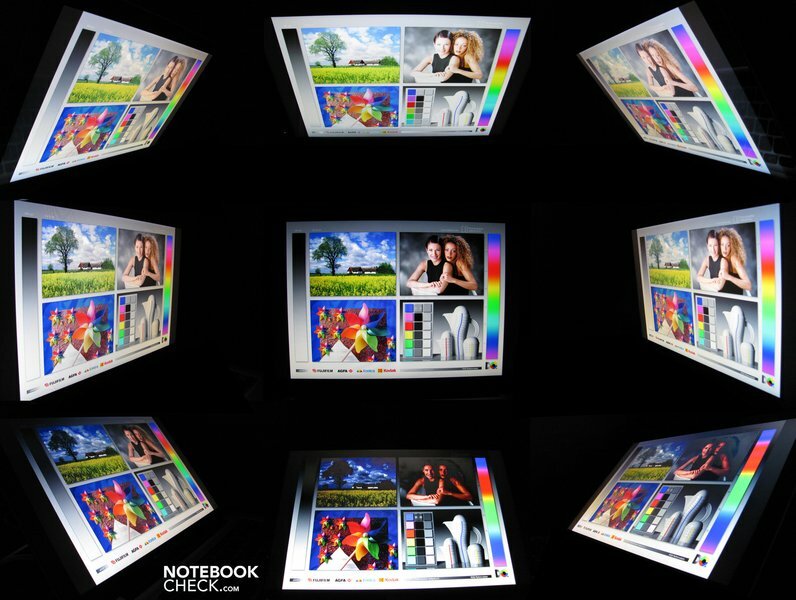 Multitouch gestures include two-finger scrolling, 4-finger swipe to access the desktop, picture rotation and many more functions, which are easy to internalize and fun to use. 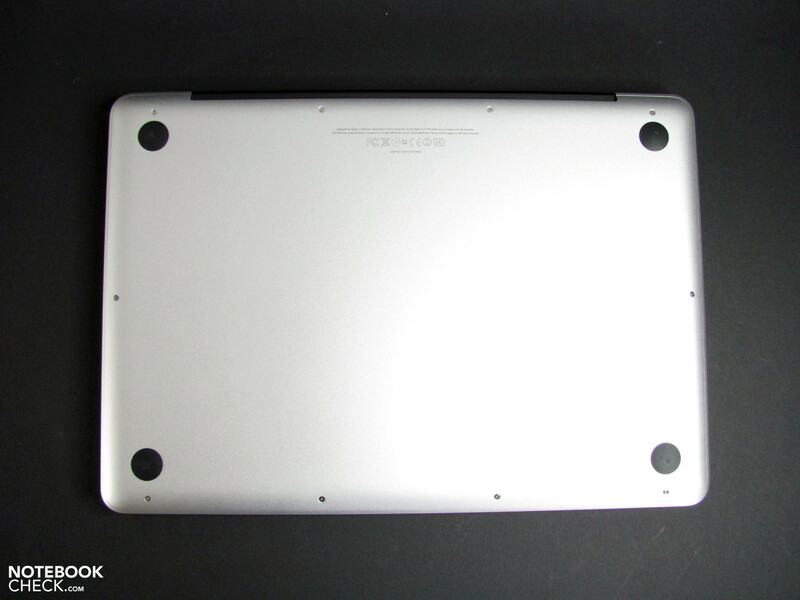 There are no separated touchpad buttons. The entire touchpad surface of it acts as a button, it actually presses in and clicks with enough pressure or can just be tapped for the same result on screen. In Windows the trackpad doesn't work quite so perfectly. The two-finger scroll only works with a good amount of effort and other multitouch gestures are very limited. Also unchanged is the 13" widescreen display with a resolution of 1280x800 pixels at an aspect ratio of 16:10. The model we're reviewing here impressed us with a very even brightness distribution value of 87% and a high maximum brightness, coming to an average of 300 cd/m2 (of all the sub-sections of the screen). The black value of 0.49 cd/m2 is also decent, contributing to a screen contrast of 633:1. 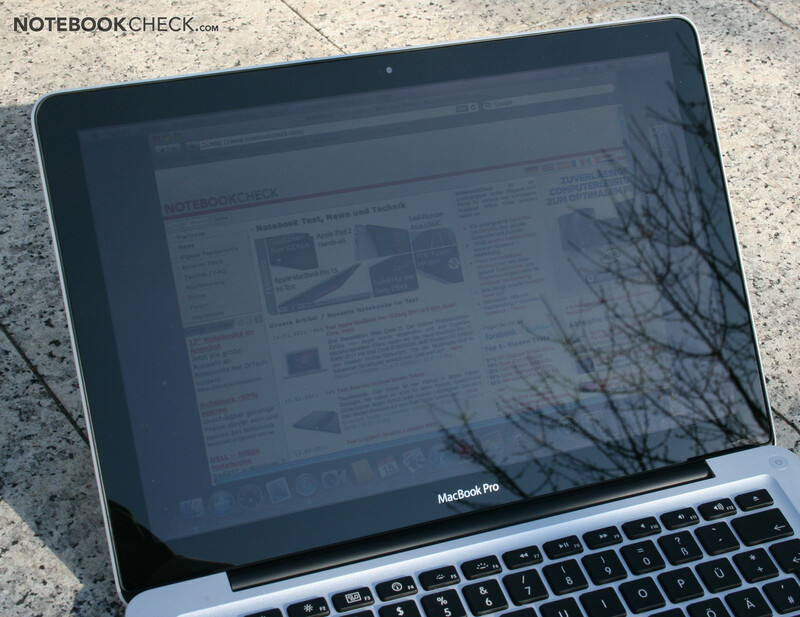 The high screen brightness is enough to keep the picture visible outdoors inthe shade, but in direct sunlight, reflections overshadow screen contents thanks to the glossy display. Even in brightly lit rooms indoors, you sometimes have to adjust the angle of the screen to avoid irritating reflections. There's the option of a matte screen for the 15" and 17" models, but not for the 13" unfortunately. The range of viewing angles is relatively good for the TN display in place here. As usual, however, looking from particularly sharp from above or below results in color inversion. 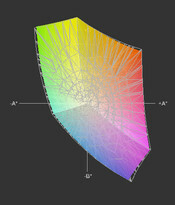 The color space covered by this high-quality TN display ranks in between sRGB and Adobe RGB, therefore making it practically identical to the that of the larger 17" MacBook Pro screen (glare-type). 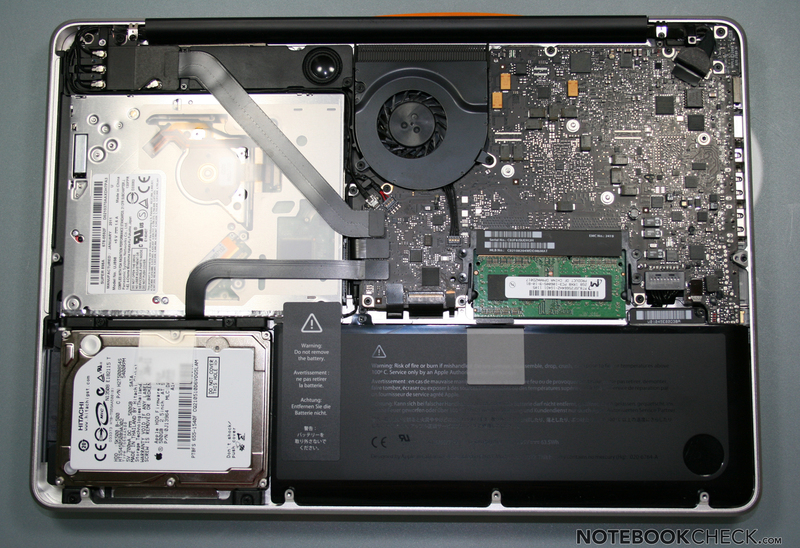 Built into the sturdy case of the MacBook Pro is the currently most powerful dual-core mobile processor. 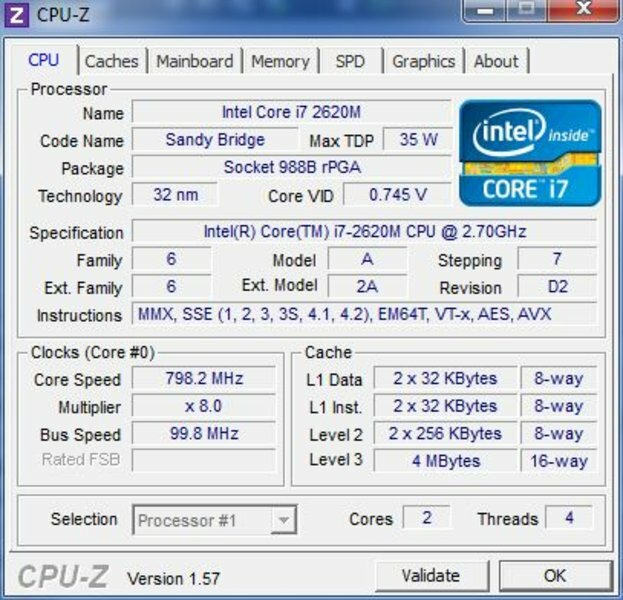 The Intel Core i7-2620M runs at a clock rate of 2.7 GHz and supports all the functions of the Sandy Bridge architecture. Among these is HyperThreading for better use of all cores, Turbo Boost for automatic overclocking and the DDR3 memory controller. For more information about the CPU, check out the Intel Core i7-2620M page. The graphics card here is the on-board Intel HD Graphics 3000, found directly on the processor. This powerful processor makes use of 4GB DDR3 RAM (2x 2048MB PC3-10700 at 667MHz from Micron). This premium hardware picture is dampened by the slow-spinning 5400 RPM hard drive, which is however fairly quiet and has a storage capacity of 500 GB. The processing power was tested, as usual, in Windows 7 64Bit (via Bootcamp). It quickly becomes clear that the processor does not reach the level of performance that we've seen, for example, in the Schenker A501. In 3DMark 06's CPU Test, the MBP13 trails 15% behind the Schenker notebook and 13% in the 3DMark Vantage test, ranking in on par with the old Core i7-620M or the new Core i5-2410M (found in EasyNote LS11, for instance). In Cinebench 10 and 11.5, the CPU here likewise comes out on par with the i5-2410M. The older MacBook Pro 15" with a Core i7-620M is 4% slower in this benchmark (for a basis of comparison). The new starter model of the MBP13 with a Core i5-2415M is a mere 8% slower. The current quad-core CPUs built into the MacBook Pro 15" and 17" models are 77% and 100% (respectively) faster than their dual-core cousins. 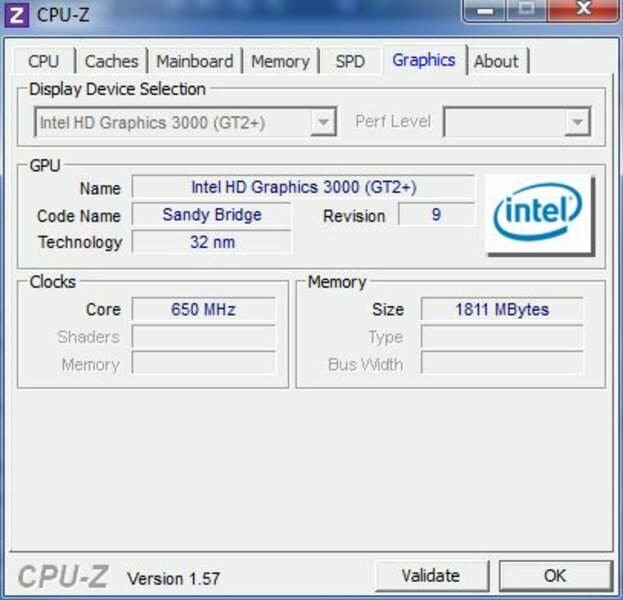 This leads to the suspicion that the Core i7-2620M can't quite reach its full potential in Windows 7, which is confirmed by a look at the CPU clock rate during heavy use. The first thing we noticed is that Apple has probably disabled the Turbo Boost function of the i7-2620M in Windows: we didn't get a reading of more than 2.7 GHz using the HWInfo32 tool. On top of that, the CPU clock sometimes gets downsampled because of temperature or power consumption values—more about that later. We measured the application performance in Windows 7 64 Bit with PCMark Vantage. Despite the lacking Turbo Boost in Windows, the performance observed is very good, on par with larger notebooks like the Envy 17 with Core i7-720QM and HD 5850 graphics card or the Ideapad Y560 with the same CPU and HD 5730 graphics card. Compared to other Apple notebooks, the new MacBook Pro 13 trails behind the old MBP 15 with Core i7-620M and a good deal behind the current MBP 15 models (which are ahead by 14-34%). It's also interesting to take a look at how the model at hand measures up to the weaker MacBook Pro 13 version with a Core i5 processor. The less powerful model performs 91% as quickly as the Core i7 model, that is, only slightly slower. 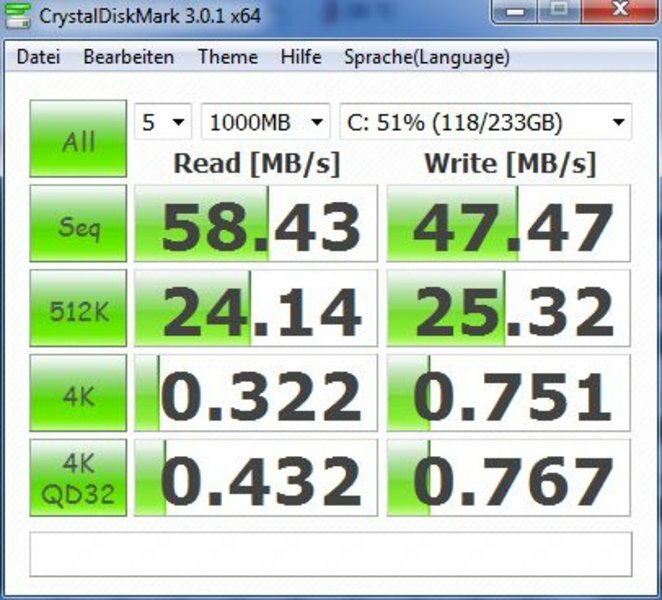 Choosing an SSD as the hard drive could result in a huge leap in performance compared to systems with traditional HDDs. 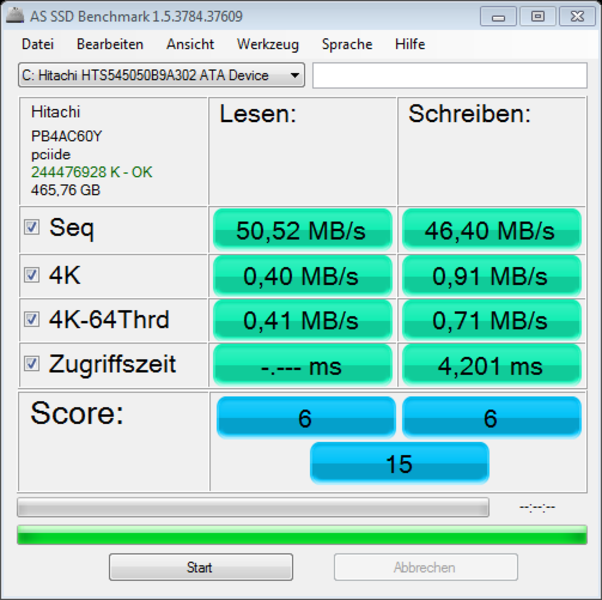 A laptop like the Schenker A501 with the same CPU and a GT 540M graphics card improves its application performance by a whopping 136% when equipped with an SSD. The results of the graphics and gaming tests in Windows likewise lead to the suspicion that the Turbo Boost for the graphics card is also deactivated in Windows. The results are almost always a good deal lower than those for a Core i7-2720QM and 2820QM although the graphics cards on those CPUs run at a similar clock rate. Only in the 3DMark Vantage GPU Test was the graphics card able to reach a score comparable to other graphics cards of its class. 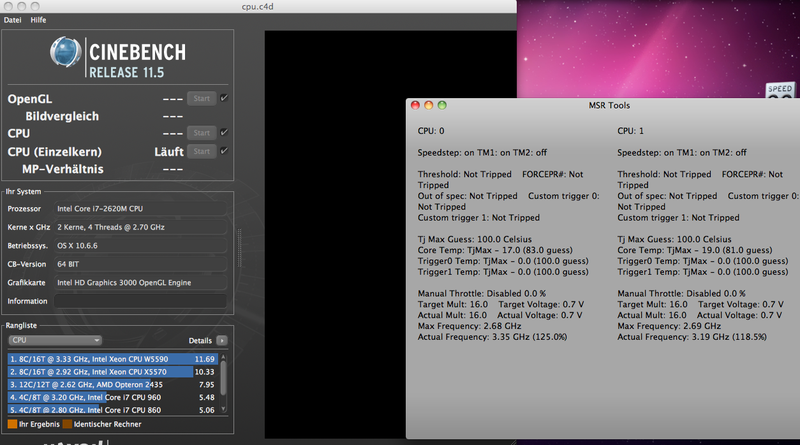 Compared to Windows notebooks, the HD 3000 in the MBP performs on par with Radeon HD 5470 in the 3DMark benchmark. The older GeForce 320M from the previous generation of MBPs actually runs 6% faster here. In the gaming tests, the HD 3000 of the more powerful MBP13 in review here ranks in behind the older GeForce 320M. Battlefield Bad Company 2 runs 17-22% slower, and Call of Duty: Black Ops a whole 75% slower, while Fifa 11 also runs a good deal slower—24-57% faster on the 320M than the Intel GPU. The graphics performance of the MacBook Pro 13, therefore, is only good enough for undemanding games like Fifa 11 with moderate detail settings. More demanding games like Battlefield Bad Company2 don't even run very smoothly with minimal detail settings. The small MBP is definitely not the right choice for gamers. The new quad-core MacBook Pro models distinguish themselves as considerably more powerful than the dual-core MBP 13 models in some of the the individual sub-tests of the XBench benchmark. Nevertheless, the speedy 2.7 GHz dual-core processor here flexes its muscles in the XBench 1.3 benchmark, surpassing the performance of the MBP 17 with a Core 2 Duo processor of the previous generation. Only in a few of the tests can the older MBP17 keep up thanks to its dedicated GeForce GT 330M GPU. 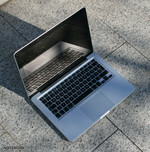 The more powerful MBP13 in review here also demonstrates its superiority to the MBP13 model with a Core i5 processor. 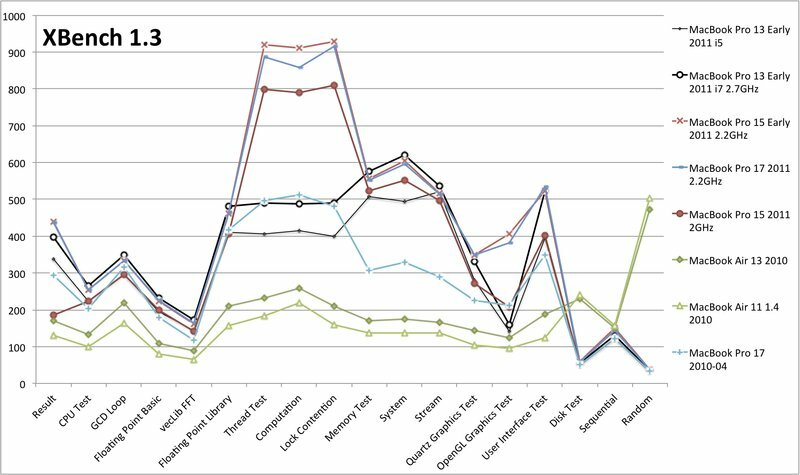 On average, the weaker MBP13 performs at 85.5% the speed (76-97% depending on the particular test) of the more powerful model in review here. 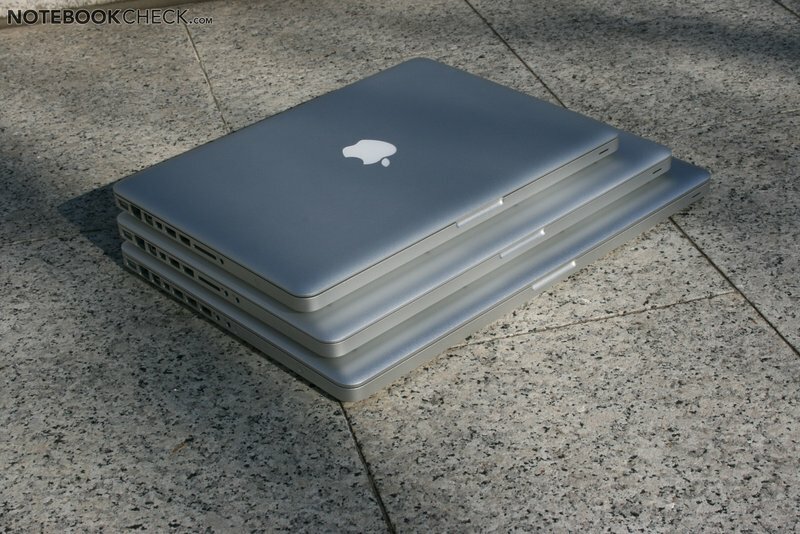 Compared to the MBP13 from 2010 (2.4 GHz with SSD), the i5 and i7 versions are at a clear advantage. Except for OpenGL and computation sub-tests, the new Sandy Bridge models easily surpass their predecessors. In Cinebench R11.5, the processor performance is considerably better: 2.74 points compared to 1.36 points—the results speak for themselves. the OpenGL performance is, however, better with the older GeForce 320M (10.8 fps vs. 12.6 fps with the 320M). It quickly becomes obvious that the benchmark scores in Mac OS X are substantially better than those in Windows 7. This is typically not the case, however. 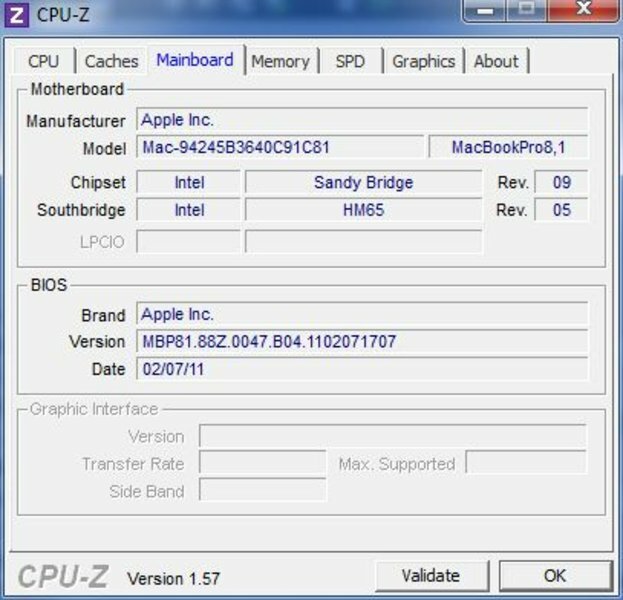 This confirms that Intel Turbo Boost works in Mac OS X. The measurements made by the MSR tool also speak to this effect during single-core use (CB11.5), the clock rate of the one core reaching as high as 3.35 GHz. 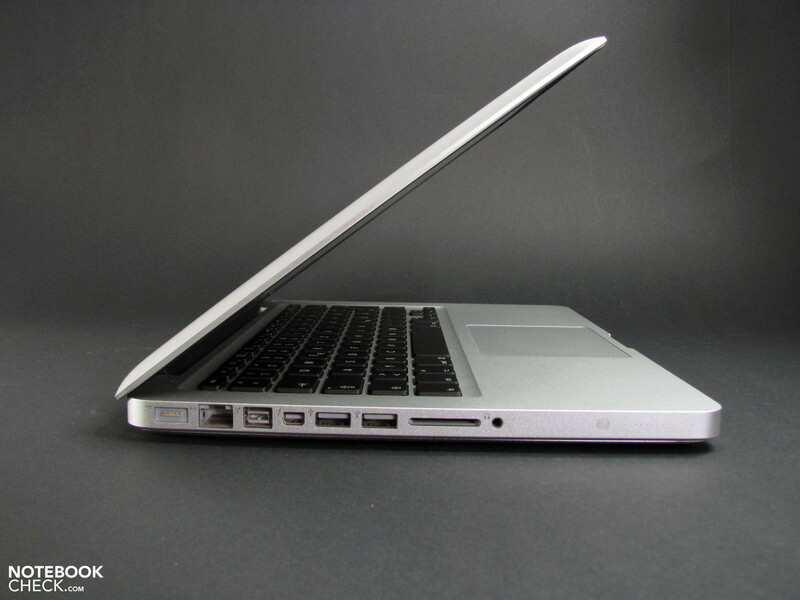 The fastest mobile dual-core processor finds its place in a compact 13" notebook and the fans stay quiet? Sounds like a huge challenge that isn't very well dealt with. Particularly in Windows does the i7 CPU quickly reach its thermal limits. On top of that, the power supply is pushed to the max, which might account for the lower clock rate observed under heavy use. 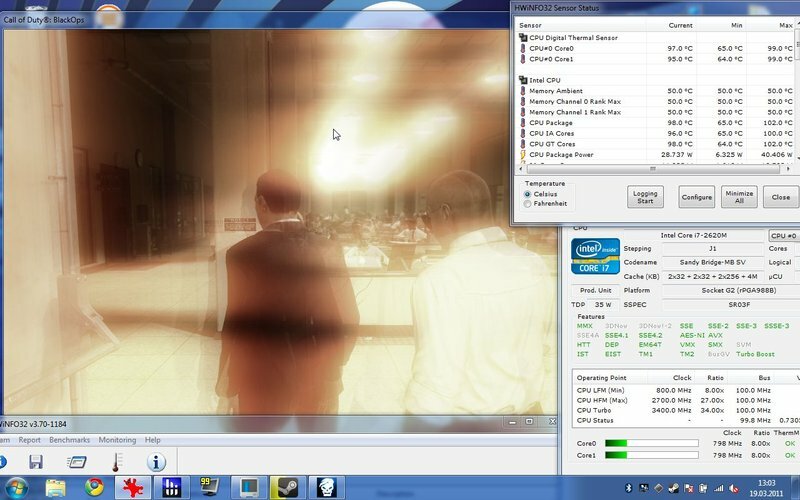 In Windows 7, we observed the processor performance under various levels of stress using the HWInfo32 tool. The processor temperature quickly climbs to near the 100°C suggested maximum temperature. With extreme stress (Furmark + Prime95) we observed an occasional downsampling of the CPU via the EFI (BIOS equivalent) down to 800 MHz. 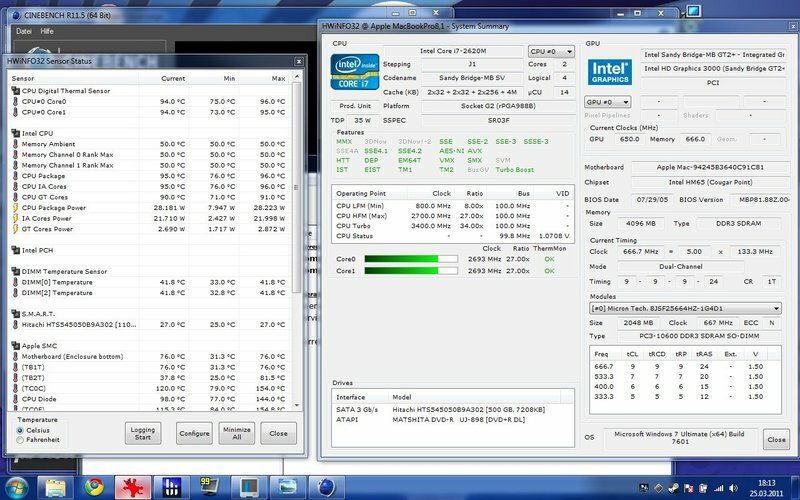 On top of that, the tool also pointed to a thermal throttling of both processor cores. This happens automatically when the CPU reaches a temperature of over 100°C. This however only occurs during the stress test, which is a good deal more extreme than everyday conditions—under normal use this should come up very rarely to never. Other than the very extreme, we tested a few other scenarios. 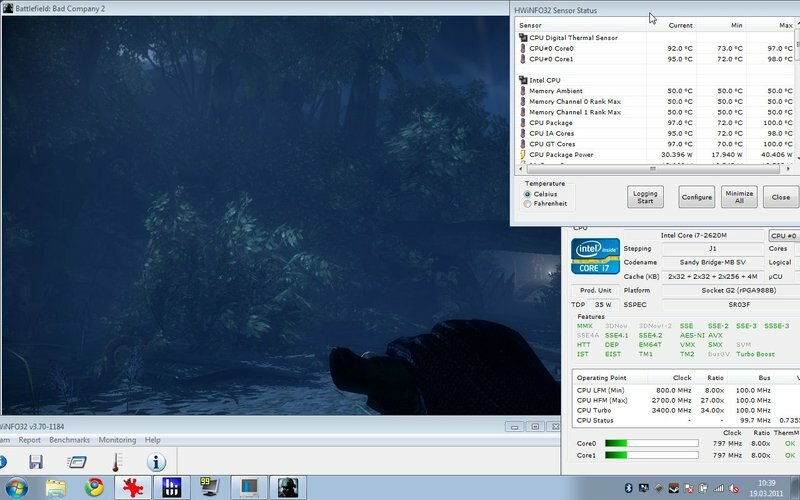 After running the highly demanding Battlefield Bad Company 2 and Call of Duty Black Ops for a while, we noticed that the CPU was being downsampled to 800 MHz by the EFI. In Cinebench R11.5 CPU benchmark, no such dropping of the clock rate was observed, the CPU staying at a constant 2.7 GHz. Running 3DMark05 a second time right after the stress test yielded an 8% lower result than the first run-through on a "cold" system. Since Turbo Boost seems to be deactivated in Windows, this might be attributable to the throttling. Windows 7 is clearly not the best operating system for the MacBook Pro and therefore its performance in Mac OS X is much more meaningful for the ratings we give it. Considering the much better benchmark results in Mac OS than in Windows, we can say Turbo Boost was running in Mac OS during these benchmarks. 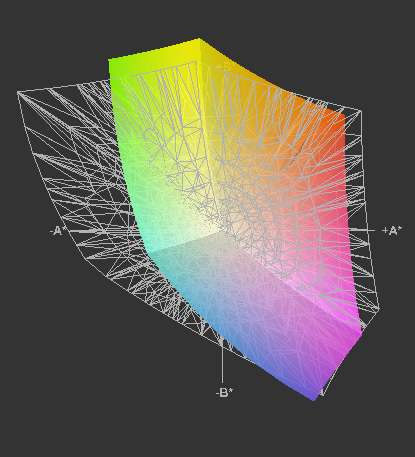 Using the MSR tool, we observed downsampling to a much lesser degree in Mac OS X. 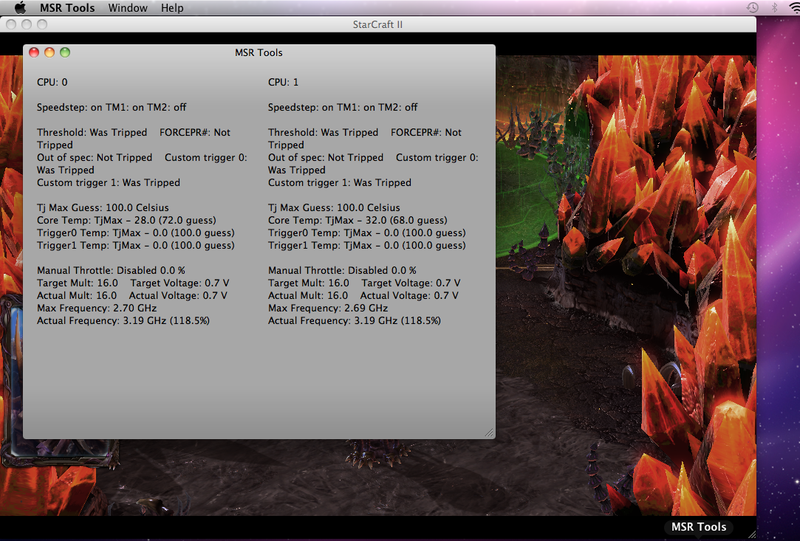 When running CB 11.5 and StarCraft 2 simultaneously, the clock rates of the two cores dropped slightly to 2.3 and 2.5GHz. Apparently, Mac OS X uses energy and cools the system much more efficiently than the Windows driver, Bootcamp. 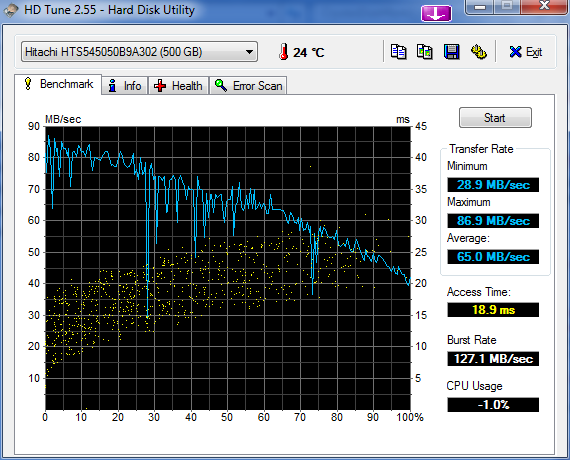 The 500 GB Hitachi hard drive in place here spins at a slow 5400 RPM and therefore achieves only average transfer rates. It transfers data a good deal slower than the 750 GB hard drive available for an extra bit of cash—which is the HDD that comes standard in the MacBook Pro 17. Theoretically, the processor supports ClearVideo HD technology for fully decoding H.264 videos. In Windows this is easy to see. In Mac OS X this isn't quite as clear. 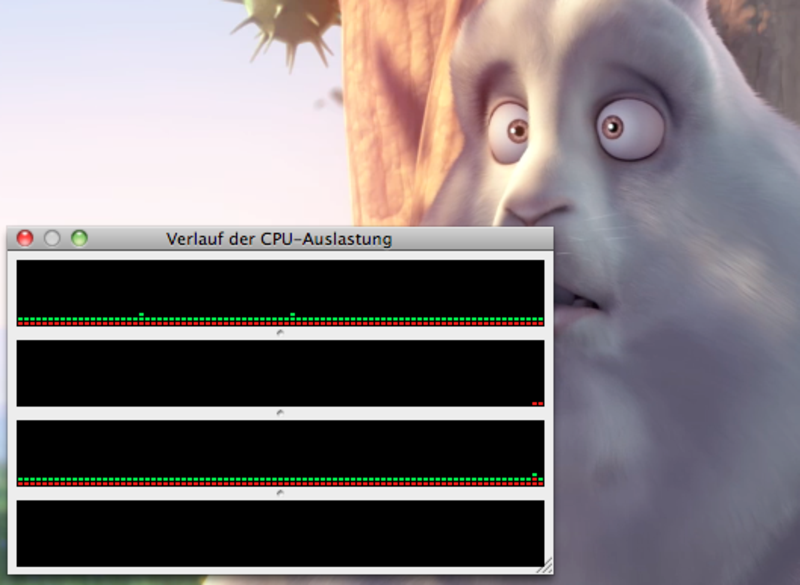 During playback of the H.264-encoded "Big Buck Bunny", Quicktime Player produced a 4.5-5% system load (overall). the independent VLC application, which runs without hardware support, produced a 10-16% system load. With an older MBP13 with the GeForce 320M GPU and built-in hardware support, we saw a system load of 9-14% (Quicktime) and 20-49% (VLC). 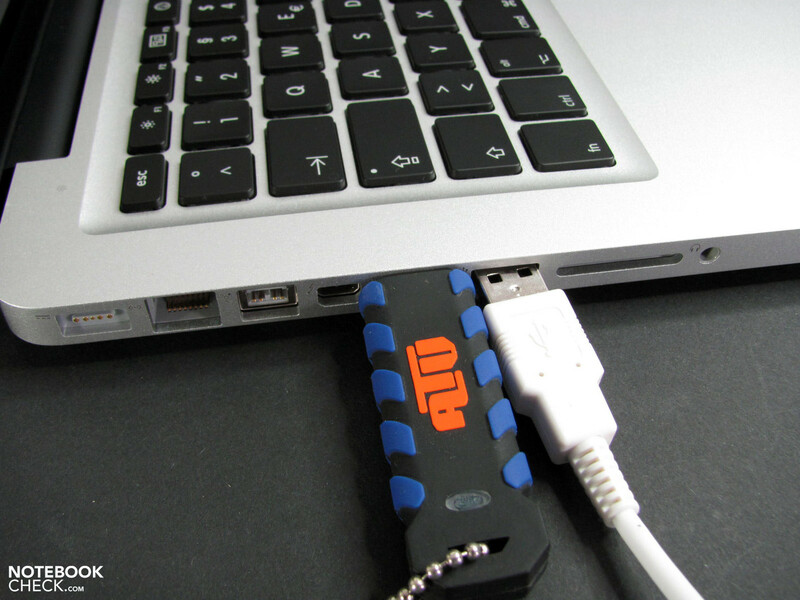 In any case, the CPU is powerful enough to decode all HD formats and smoothly play them without any hardware support. The DPC Latency Checker shows some fair results as was the case with other MBP models in Windows with only sporadic latencies jutting out into the yellow = more than 1000 µs. Despite the powerful processor, under light use noise is not an issue. The small fan spin at 2000 RPM and remains practically silent. Only the hard drive makes its presence known through a constant audible hum, the sound of which becomes slightly muffled with your right hand on the palm rest (despite the rubber mounting of the HDD). The difference is, however, very subtle in the test model at hand. Reports of much greater differences in volume are circling around the internet. Transistors whistling or squeaking was not something we observed. 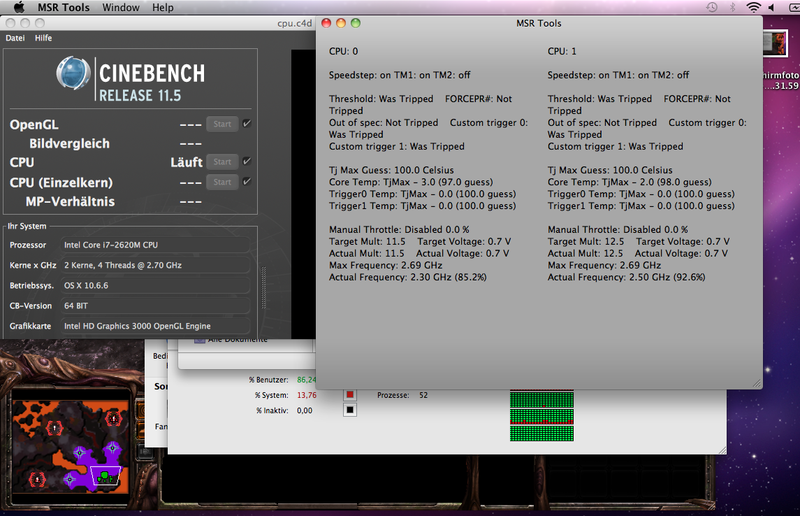 Under heavy use the situation isn't much different than with previous generations of the MBP 13. The fan supposedly has the same properties as before, but it seems to start sooner and seems to spin at higher speeds. So, while playing games or doing other CPU-intensive tasks, the fan can rotate as fast as 6200 RPM and reach a loud 44.7dB. 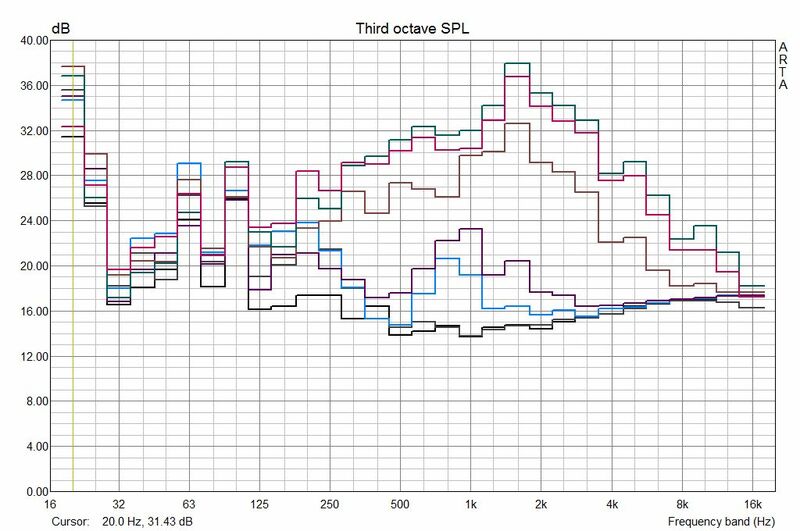 According to the noise measurement in sones, this is 4x as loud as under light use. The quality and level of noise here is somewhat unpleasant. Compared to the premium model from 2010, we measured slightly lower temperatures along the top of the base unit. The temperature along the base plate, on the other hand, remain similar. 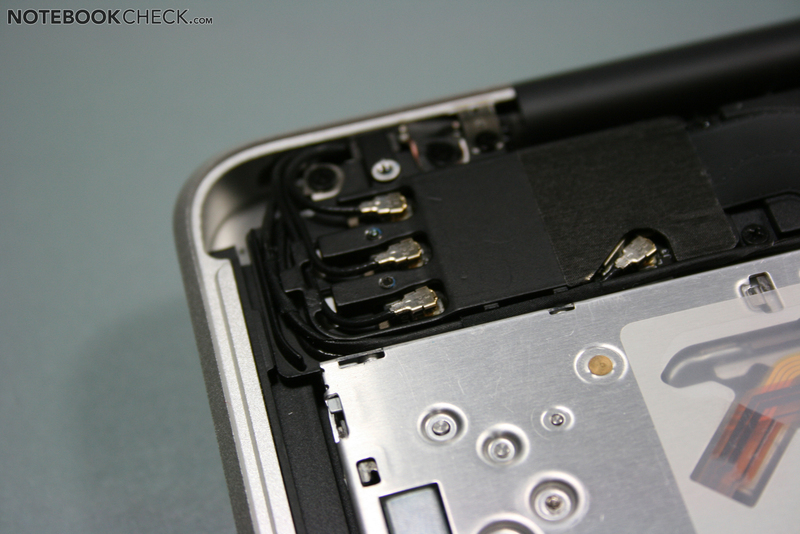 We also noticed that Apple uses the entire aluminum unibody case as a large heat sink of sorts. Under light use, the surface temperatures remain quite low, usually below body temperature. There are situations under light use during which the fan has not yet kicked in and the case surface does rise in temperature. This translates to it sometimes being uncomfortable to keep the notebook on your lap (especially in summer). The palm rest, however, always remains quite cool. (+) The average temperature for the upper side under maximal load is 31.9 °C / 89 F, compared to the average of 30.7 °C / 87 F for the devices in the class Subnotebook. (+) The maximum temperature on the upper side is 38 °C / 100 F, compared to the average of 35.8 °C / 96 F, ranging from 22 to 57 °C for the class Subnotebook. (+) In idle usage, the average temperature for the upper side is 29.4 °C / 85 F, compared to the device average of 30.7 °C / 87 F.
(+) The palmrests and touchpad are cooler than skin temperature with a maximum of 30 °C / 86 F and are therefore cool to the touch. 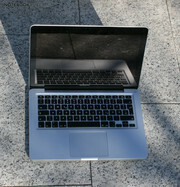 (±) The average temperature of the palmrest area of similar devices was 28.6 °C / 83.5 F (-1.4 °C / -2.5 F). 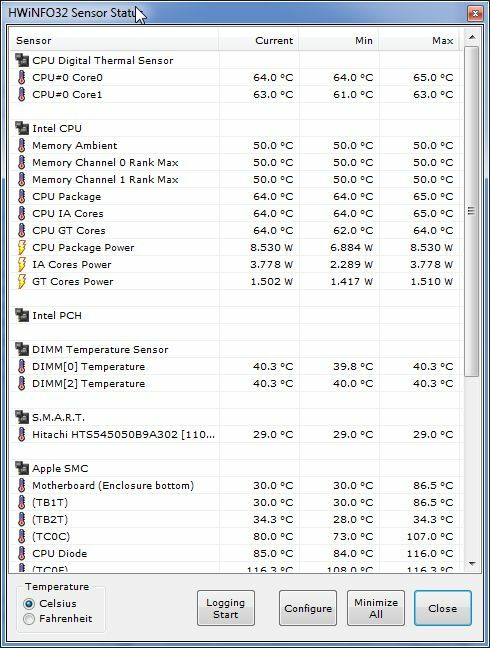 Under heavy use, the Core i7-2620M becomes critically hot. 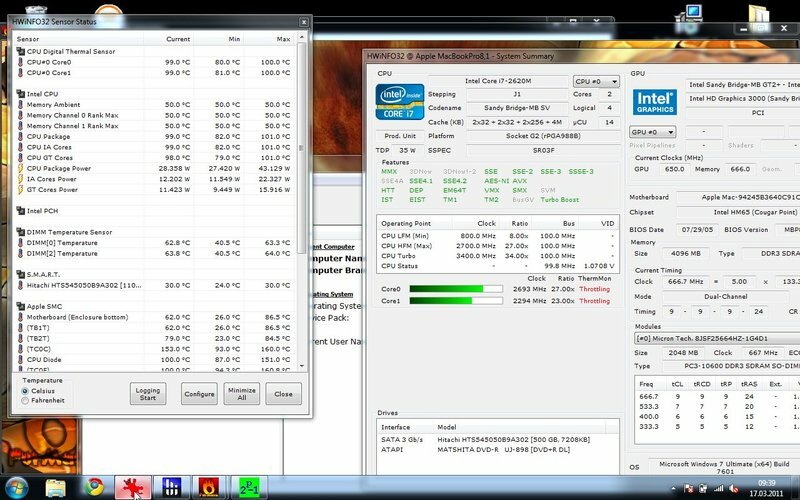 The HWInfo32 tool reports temperatures of 95-100°C for the individual cores and the CPU as a whole. 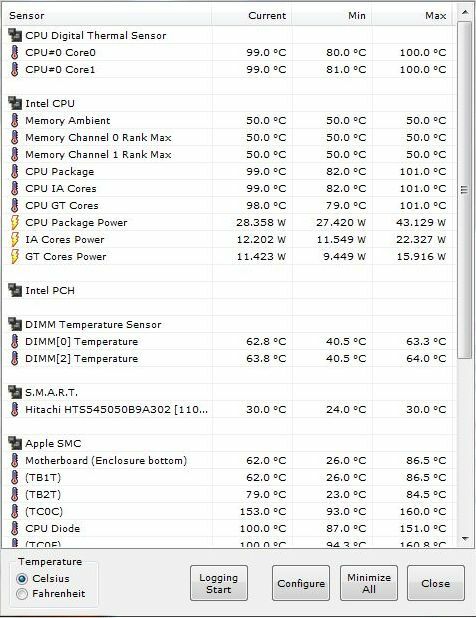 This means that the CPU and on-board graphics card reach their maximum temperature (100°C according to Intel). Memory and motherboard (both a bit over 60°C) and the hard drive (just a bit over 30°C) stay within bounds, on the other hand. Under light use, however, the processor stays nice and cool around 65ºC despite the slow-spinning fan. 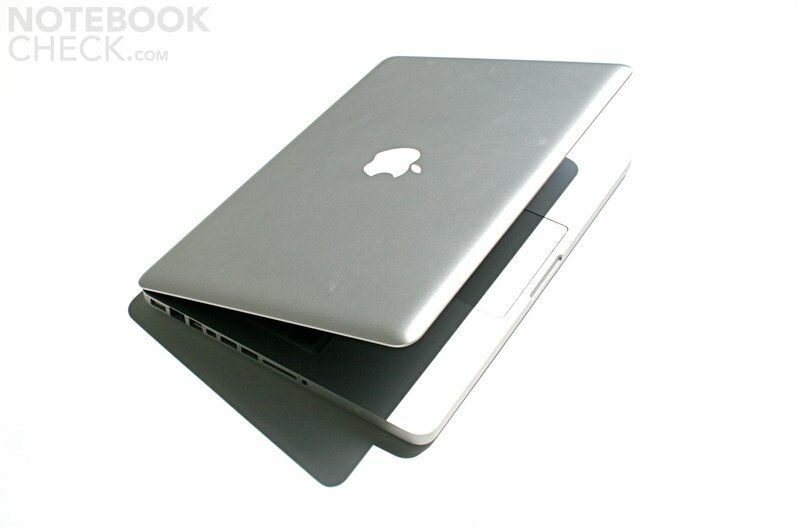 The 13" MBP comes with a 2.1 sound system found above the DVD drive and plays music in the direction of the screen. Since both speakers are placed right next to each other, the stereo effect isn't ideal. The sound quality is good enough for background music or short videos. The maximum volume is not very loud. A good distortion-free sound is transmitted through the Headset Port (headphone jack). Our AKG K181DJ sounded quite good playing music via this port. The signal was also sufficient for the high-ohm AKG K701. 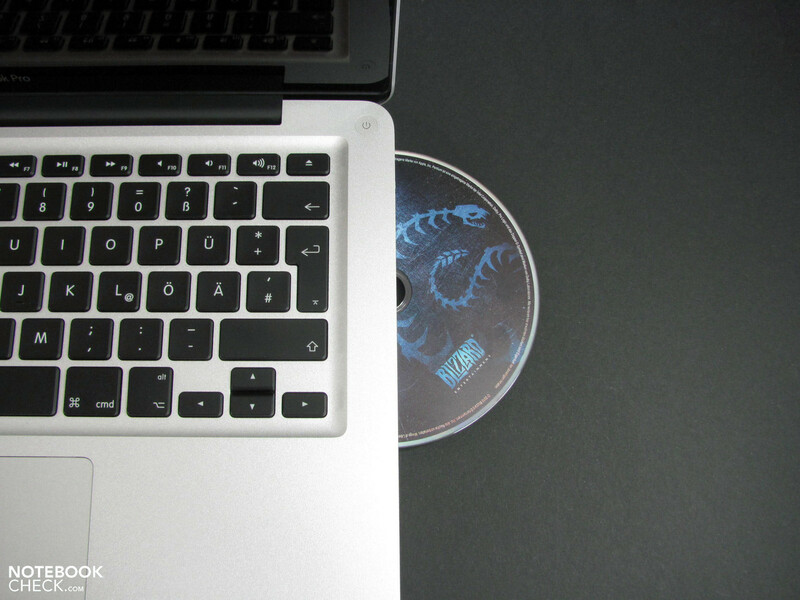 Compared to the older Core 2 Duo MacBook Pro 13 from 2010, our test model was able to play a DVD for 18 minutes longer with screen brightness all the way up for. Under very light use (reading a document at minimum screen brightness) and while browsing the internet via wifi (not standardized), the battery life for the new and old MacBook Pros is comparable. Only under very heavy use does the new MacBook Pro die a good deal faster—the much more powerful processor makes its presence known. The new 15" and 17" models manage a considerably better battery life thanks to their larger batteries. Thanks to the capacity of the battery and the restrained energy consumption in Mac OS X, the 13" MBP makes into the elite group of current notebooks. With a realistic battery life of 4-5 hours, even longer trips are possible. the non-removable battery, however, remains a big downside. The battery at hand should last for more charge cycles than typical notebook batteries and can be replaced by Apple for not too high a cost, but you still don't get the choice extending your battery life by swapping in a second, spare battery. 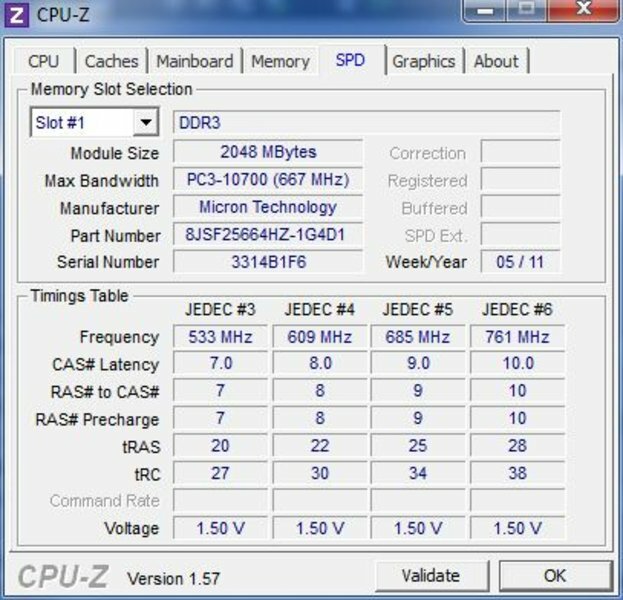 The power consumption was measured to be a good deal high than that of the 2010 model with a Core 2 Duo processor. No matter whether idle or under heavy use, our measurements for the model at hand were always higher. 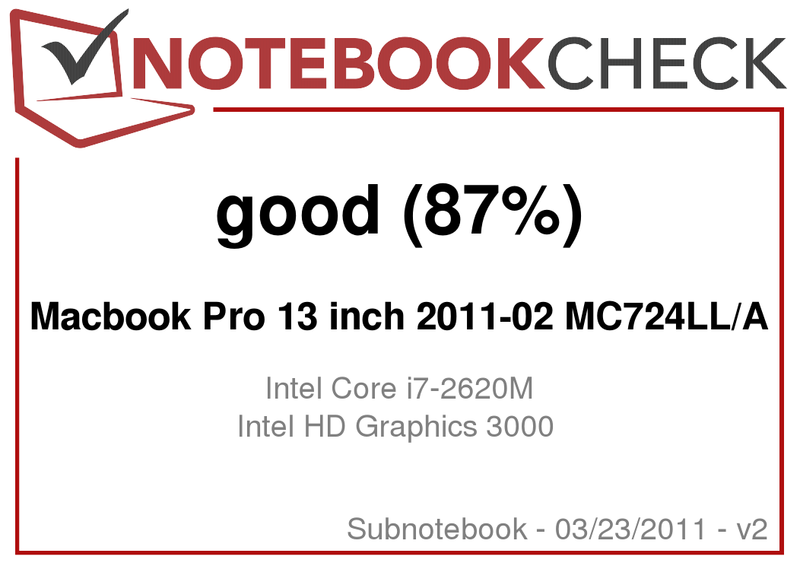 The powerful Core i7 version of the MacBook Pro 13" from early 2011 reveals various qualities in review. the high clock-rated Core i7-2620M pushes the cooling system to its limits, especially in Windows. 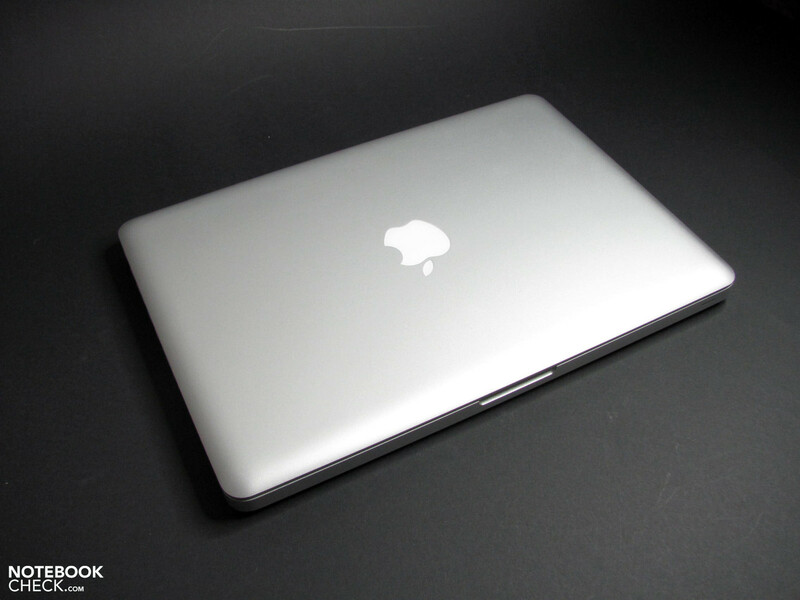 Compared to the 2010 MBP 13, the model here shows substantially improved processor performance. The high energy consumption and fan kicking in earlier make their mark on the battery life. Nevertheless, the battery lasts a good while under typical everyday conditions. Windows 7 users (using Bootcamp) can't really profit from the more powerful CPU in place here. The lacking Turbo Boost and observed throttling greatly diminish its advantage over the Core i5 model. 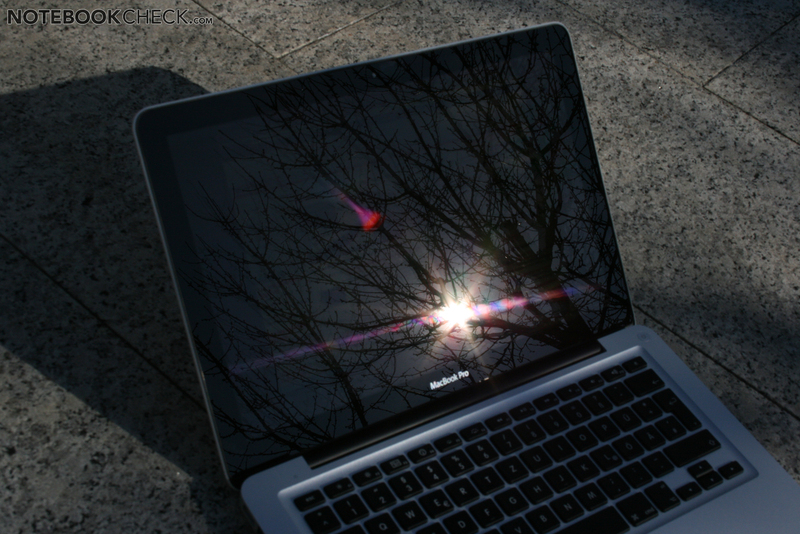 But Mac OS X users can profit a good deal for the Core i7's boost in performance. The graphics performance of the integrated Intel GPU turns out to actually be worse on average. 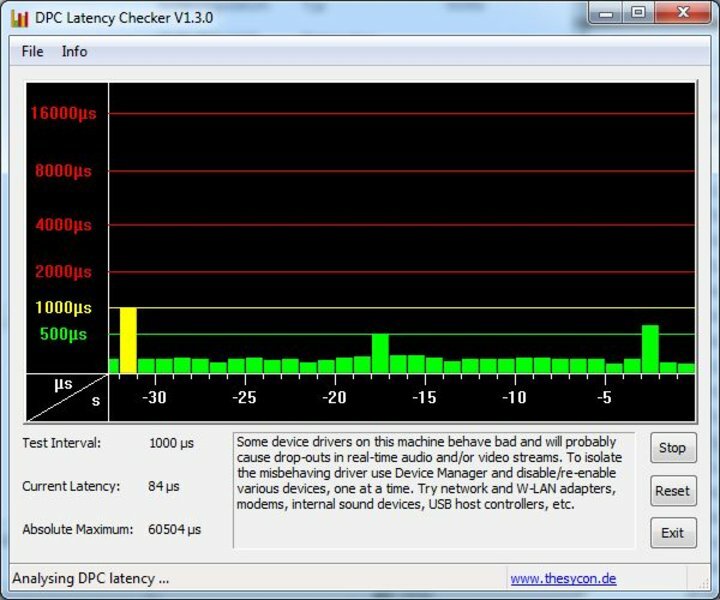 Particularly in Windows 7, the HD 3000 represents a big step backwards and Turbo Boost doesn't work. Users more interested in office applications rather than gaming should feel their needs are met, though. 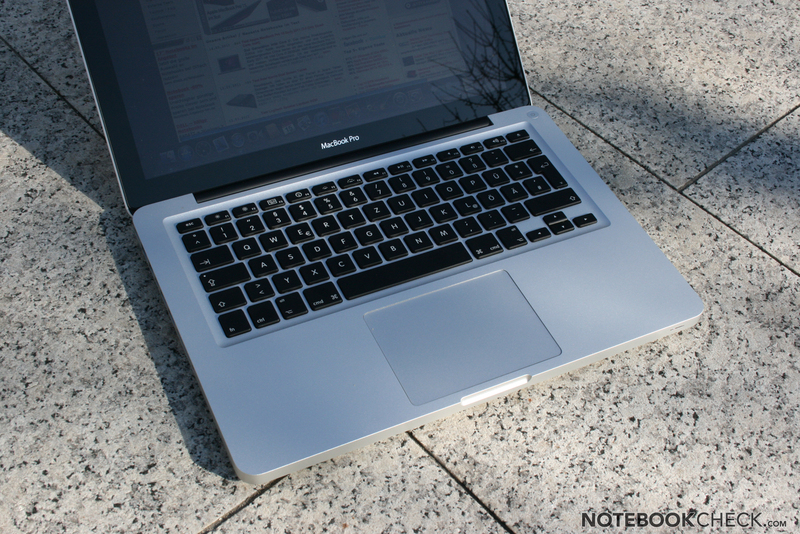 In MacOS, the MacBook Pro 13 makes for an overall very good notebook. 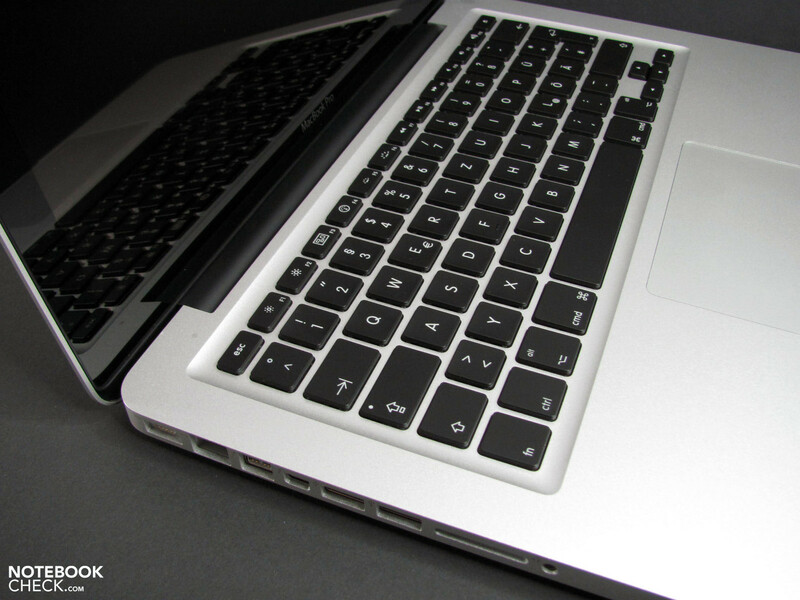 The unibody case, keyboard and touchpad are unrivaled in quality. Combined with a powerful battery, the 2 kg laptop is incredibly portable, although mobility is restricted by the reflective (but otherwise very good) display. The extra cost for this more powerful version will really only prove worthwhile for very few users who would probably want an SSD in place as the hard drive as well—which, however, provides for a big boost in speed for any user. 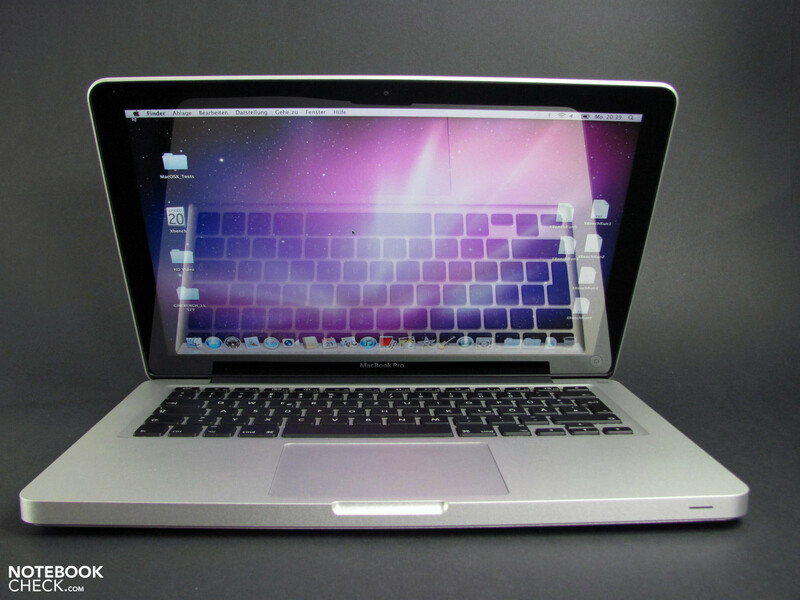 The new MacBook Pro 13 presents itself with an unchanged exterior. Only the lightning symbol next to the MiniDP port marks the new ThunderBolt port. ... we also find the wifi card now with 3 antennae. ... after removing 10 screws. The ports are few and close together as usual. The otherwise good screen looses value because of reflections constantly popping up. The 5400 RPM HDD is the loudest component under light use, becoming only slightly muffled by placing a hand on the left palm rest. Still, it's not very loud. A matte screen. But then who'll buy the 15" version? That Apple exploits the full potential of the processor. 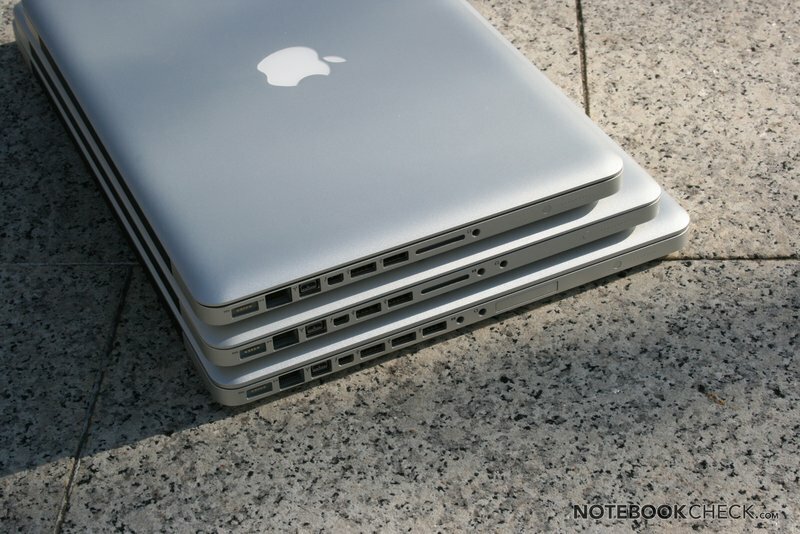 Of course the Core i5 starter model of the MBP13, but also the white MacBook or the 13" MacBook Air. In the Windows world, the less expensive Asus U36JC or the soon-to-be-released Timeline laptops from Acer.